Not all office paper products are created equal. Sandia Office Supply has a large selection of printer and copy paper to fit a variety of machines and document production needs. Our printer and copy paper is available in weights ranging from 20 lbs. (commodity multi-use copy paper) to 32 lbs. (or more for specialty papers) and in various brightness levels and colors. Because there are so many choices when it comes to printer and copy paper, we know finding exactly what you need may be challenging. Your personal customer service representative can help! Tell us what type of printer or copy machine you have (inkjet or laser/electrostatic machine) and the purpose of your documents, and we’ll recommend the brand, weight, brightness, etc. for optimal print quality. When you need office products, you need them quickly…and that’s how Sandia Office Supply delivers. We offer free next-day shipping with no minimum order to almost anywhere in the country. We also provide an easy ordering experience with our barcode catalog and scanner or online system and a hassle-free return policy. Open an account with Sandia Office Supply in Albuquerque, NM to access an inventory of over 30,000 office products and unmatched customer service. 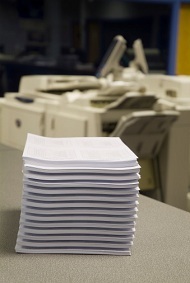 Call 505-341-4900 to order your printer & copy paper from Sandia Office Supply of New Mexico today!